I got real sick of paying Mediacom insane amounts of money for a home phone with no voicemail. So I quit paying Medicom for TV and phone and now only have their internet service (at 20 mbps it isn’t East Coast fast but it’s enough to run our new phone, stream multiple 1080p movies, and still run our iOS devices when we get email, play with apps, etc.). Rachel and I wanted to make sure the kids had a home phone, however, in case they needed to use it, as they get older and spend time in the house alone more, etc. At least until we all have cell phones. So we settled on Ooma. I chose Ooma because Consumer Reports said it was a good buy and that they were happy with the call quality and the equipment. Overall, I concur. I am very happy with the Telo box, the customer service has been very good, and the call quality is great. My current cordless phone system works by plugging the base station into the Telo box and I got a wi-fi adapter so I can place the box anywhere in my house I want my home phone to originate from. I ported my home phone number over to it which cost $30 but the service was great. I received multiple emails from Ooma letting me know where they were in the process and I didn’t have to do anything but fill out a simple form online. There are problems, however. The basic service is free and is plenty for anyone that just wants a basic home phone. Just want voicemail and a phone number? You got it! I wanted, however, to use their mobile app to make calls from my house from anywhere in the world via wi-fi so I spent the $10 on their iOS app and figured I’d use the Premier trial period during our trip to Europe to call home for free when at the hotel. Didn’t work. I could get my mother on the phone to talk to my kids for 1-2 minutes tops before the app would cut out, crash, or the quality would get so bad I couldn’t understand them. It didn’t seem to matter which city I was in, how great the wi-fi spot was, etc. It just didn’t work very well. $10 down the drain. I might have kept the Premier Service for some of the really nice features it has (like $60-99 per year) but one of the biggest draws of Premier are services that I understand would be best used with the Telo handset paired with the Telo box. You can’t get a Telo handset. Out of stock. For months. So, until they have them available and I can get one cheaper than they were selling them when they first came out, I’m not going to be too excited about upgrading. I then call to cancel my Premier service as the trial period is ending and I want to keep it free (only pay $3 and change for taxes/govt. fees) but the phone number doesn’t work very well for Ooma. If you know the options you need to push already, it’s fine. But if you pull the phone away to push “1” for “customer care,” by the time you get the phone back to your ear, the next set of directions has fast forwarded to the last option (that you won’t need) and it just gets quiet………………no repeating of the options………….silence. I finally called back a third time after having someone manning their online chat tell me to try option 2 at the beginning instead. Same fast-forward skipping to the end and silent treatment. I just hit a “1.” I hit a “1” again. Finally got help. Very friendly, offered me a discount on Premier Service which I politely declined. I told her about their customer service automation trouble on their phone lines. I believed her when she said she’d pass it on. Then I find out I don’t need Premier to use the mobile app so I’m hoping they update it and make it work because that has the potential to be AWESOME! So I’m sitting here typing this with a good home phone. Great quality, virtually free, nice box. If I need technical help or advice, their online chat feature is great. The price is unbeatable. So I highly recommend The Ooma with a few caveats – don’t rely on their mobile app (it probably won’t work), be patient if their customer service phone line is quirky (just hit numbers…someone will help), and perhaps wait ’till the Telo Handset is back on the shelves if you think its feature set may be useful. It’s a young company with a well-designed product, great quality, and it’s almost FREE! 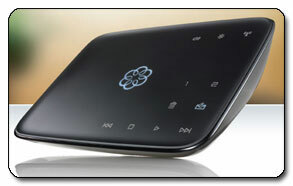 If you really want to cancel your home phone service but just aren’t quite sure, get Ooma. You are currently browsing the Technology category at Eric Goranson.